I wanted to write something tonight. I really did. I wanted to write something profound, something amusing and winsome, something worthy of a link from ‘the’ Tim Challies. That’s the only reason I care to write, really. But I got nothing. It’s technically Wednesday now, so I shouldn’t actually be posting anything, since I’m infringing on Amy’s day… my apologies, Amy. But lest all you avid readers out there should think I have disappeared forever, I shall at least post a recipe. 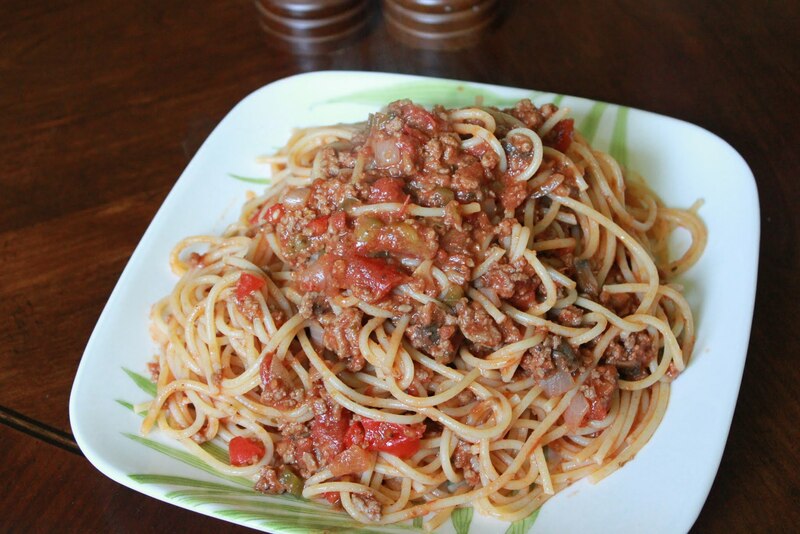 Don’t we all need a good spaghetti sauce recipe? I think we do. So if you don’t already have a fave, try this one out. It’s kind of a mish-mash of my own recipe with some ideas from Mel’s version. Bon Appetit! Heat oil in a large dutch oven over medium heat. Add onion and peppers (and mushrooms if using) and cook for 2-3 minutes. Add red pepper flakes and garlic and sauté until fragrant. Add ground beef and season lightly with some salt and fresh ground black pepper. Cook until browned and drain slightly if necessary. Add tomatoes and the rest of the spices. Add more salt (1/2 to 1 tsp) and pepper, and allow to simmer for about 1 hour, over low to medium heat. Feel free to add a tablespoon of balsamic vinegar and a large handful of parmesan cheese at the end. I sometimes do, sometimes don’t.